Fortesse conditioner delivers complex hair care. The formula with Hair Vitality Complex™ boosts growth of new hair, prevents hair loss, hydrates and adds natural shine. With Fortesse conditioner hair is static-free, conditioned and easy to style. The conditioner cares for the scalp and does not weigh hair down. That is why you can apply it directly to your scalp. The product has been dermatologically tested. The best results of the treatment can be observed by using Fortesse shampoo and conditioner simultaneously. Why does Fortesse conditioner deliver such good results? The unique formula of Fortesse conditioner contains vitamins and minerals necessary for healthy-looking hair. Horsetail prevents dandruff and hair loss and adds shine. Vitamin B3 stimulates hair growth, saw palmetto hinders excessive hair loss and castor oil delivers much needed hydration. Biotin adds volume, strengthens damaged hair and makes it thicker an fuller. We are absolutely certain of the effectiveness of our products. 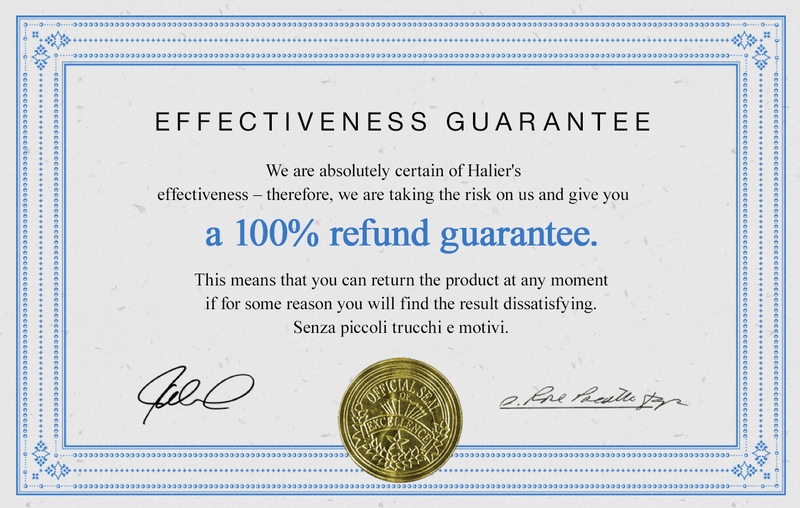 Therefore we give you 100% money back guarantee. You can return the product within 90 days if you think it has not fulfilled your expectations. I've been using Fortesse for a month now. I am so totally rapt. My hair detangles easily and it's so shiny! Wow! Fortesse conditioner has no match. I love the smell and the fact it doesn't drip down. I like the packaging, too. The bottle is economical and very handy. :) 100% yes! Girls, if you're looking for safe and effective conditioner at a reasonable price, I can totally recommend you Fortesse. It doesn't make your hair greasy and you can apply it directly to your scalp. My hair was terrible. I had split ends and horrible dandruff. I'd tested many conditioners but none of them worked for me. My hairdresser showed me Fortesse line. The conditioner improved my locks. My hair looks better now - no static, no tangling. Horsetail is a great source of easily assimilable silica, potassium, magnesium, quercetin and vitamin C.
It helps maintain healthy strands, prevents hair loss and improves hair elasticity. They minimize keratosis and help regulate sebaceous glands. They also help minimize the symptoms of psoriaris and dandruff and prevent blocked hair follicles. It helps reduce hair loss. Active form of vitamin B3. It penetrates hair structure and delivers much needed hydration. It also helps maintain proper blood supply to the scalp, reduce excessive hair loss and stimulate hair growth. Ricin oil is a natural emulsifier. It conditions, moisturizes and protects your hair. In the cosmetic industry it is used as an ingredient in shampoos and conditioners. It also helps balance the oil production and reduce discoloration. Conditioner boosting hair growth and preventing hair loss with Hair Vitality Complex™ formula. Use: apply the conditioner onto damp hair and distribute from the roots to the very ends. Leave on for a few minutes. Rinse well. The next step of hair care is using hair serum from Fortesse line. Ingredients: Aqua, Cetearyl Alcohol, Behentrimonium Chloride, Propylene Glycol, Dimethicone, Ricinus Communis Seed Oil, Olive Oil PEG-8 Esters, Panthenol, Glycerin, Phenoxyethanol, Silicone Quaternium-16, Equisetum Arvense Leaf Extract, Sereno Serrulata Fruit Extract, Parfum, Niacinamide, Helianthus Annuus Seed Oil, Undeceth-11, Ethylhexylglycerin, Butyloctanol, Disodium EDTA, Undeceth-5, Biotin, Alpha-Isomethyl Ionone, Butylphenyl Methylpropional, Citronellol, Eugenol, Geraniol, Hexyl Cinnamal, Hydroxycitronellal, Hydroxyisohexyl 3-Cyclohexene Carboxaldehyde, Limonene, Linalool. Results: Fortesse conditioner delivers complex care. Innovative Hair Vitality Complex™ formula boosts hair growth, prevents hair loss, hydrates and adds natural shine. With Fortesse conditioner hair is free of static, conditioned and easy to style. The conditioner does not weigh hair down. The product has been dermatologically tested. Important information: if the conditioner gets into your eyes, rinse with plenty of water. Who is Fortesse conditioner for? Fortesse conditioner is a product dedicated to women who wish to take care of their hair thoroughly. Unique Hair Vitality Complex™ formula accelerates hair growth, prevents hair loss, hydrates and adds natural shine. With Fortesse hair is static-free, conditioned and easy to style. The conditioner nourishes the scalp and does not weigh hair down so you can apply it directly to your scalp. The product has been dermatologically tested. Is Fortesse conditioner dedicated to all hair types? Fortesse conditioner can be used by women with all hair types. The product perfectly revives dry, damaged, oily and prone to falling out hair. Yes, Fortesse conditioner has been dermatologically tested and does not cause scalp irritations. What are the ingredients of Fortesse conditioner? The ingredients of Fortesse conditioner: Aqua, Cetearyl Alcohol, Behentrimonium Chloride, Propylene Glycol, Dimethicone, Ricinus Communis Seed Oil, Olive Oil PEG-8 Esters, Panthenol, Glycerin, Phenoxyethanol, Silicone Quaternium-16, Equisetum Arvense Leaf Extract, Sereno Serrulata Fruit Extract, Parfum, Niacinamide, Helianthus Annuus Seed Oil, Undeceth-11, Ethylhexylglycerin, Butyloctanol, Disodium EDTA, Undeceth-5, Biotin, Alpha-Isomethyl Ionone, Butylphenyl Methylpropional, Citronellol, Eugenol, Geraniol, Hexyl Cinnamal, Hydroxycitronellal, Hydroxyisohexyl 3-Cyclohexene Carboxaldehyde, Limonene, Linalool. How to use Fortesse conditioner? Apply the conditioner to damp hair and spread it from the roots to the very ends. Leave on for a few minutes. Rinse well. The next step is using hair serum from Fortesse collection. How long does one Fortesse conditioner bottle last for? One Fortesse conditioner bottle is enough for 2-month use (with optimal use 3-4 times a week). Does Fortesse conditioner cures baldness? Fortesse conditioner contains specially selected ingredients which prevent hair loss and stimulate its growth. The product does not cure baldness. Where can I buy Fortesse conditioner? 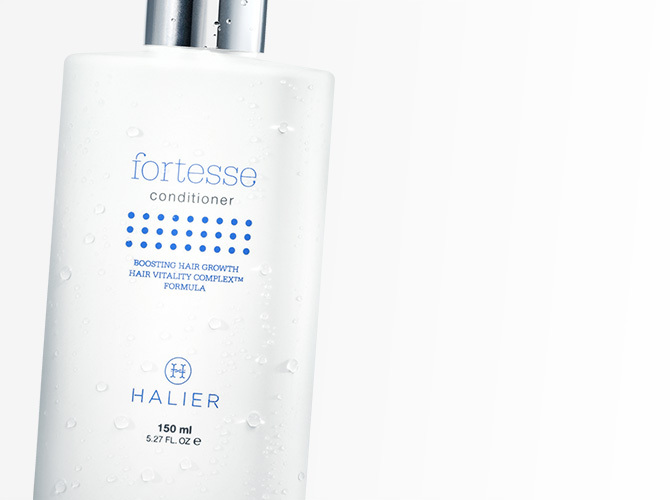 Fortesse conditioner can be purchased via our online shop www.halier.co.uk, in selected hair and beauty salons and stores throughout the country.